At Premier Podiatry, our knowledgeable, compassionate and dedicated healthcare professionals' goal is to provide exceptional comprehensive foot and ankle care to patients, allowing them to enjoy an active lifestyle. We strive to achieve this by utilizing both effective conservative and surgical treatment methods for all foot and ankle conditions through the use of traditional practices and advanced state-of-the-art technologies. We educate our patients, so that they can be involved in their treatment and make informed decisions. Our team is highly committed to continuous development of professional skills, integrity and personal growth, so that we can assist our patients in a manner consistent with a pleasurable clinic experience, accurate information and uncompromising excellence in podiatry. Check with your insurance company if you need a referral prior to your appointment. If you have special requests or needs, please inform one of our staff members before arriving for your appointment, so that we can accommodate you. If you have orthotics or use an assisted walking device, please feel free to bring them with you as well. Before and during your initial visit at Premier Podiatry, we make sure to obtain thorough information about you and your medical history. Our staff will ask you questions about your current medical issues, symptoms, family history, medications, allergies, certain habits and surgeries that you might have had. Having the most up-to-date information ensures that the doctor can provide the best possible treatment options for you. Our patient care coordinator is going to help you fill out your forms electronically if you haven't already done so prior to your appointment. Our podiatrist, Dr. Velimir Petkov, is going to examine your feet in detail. He might run or order any necessary tests that will help identify the area of concern. Based on your medical history, thorough examination and test results, Dr. Petkov is going to make specific recommendations in terms of a treatment plan. We always strive to provide you with the best possible foot care, so that you can enjoy an active lifestyle. We invite you to take a proactive approach when it comes to your foot health. Ask us any questions that you might have about your condition or treatment plan. We are happy to educate patients about podiatry, related conditions, and proper foot care. If your condition requires a prescription, one will be sent electronically to a pharmacy of your choice. 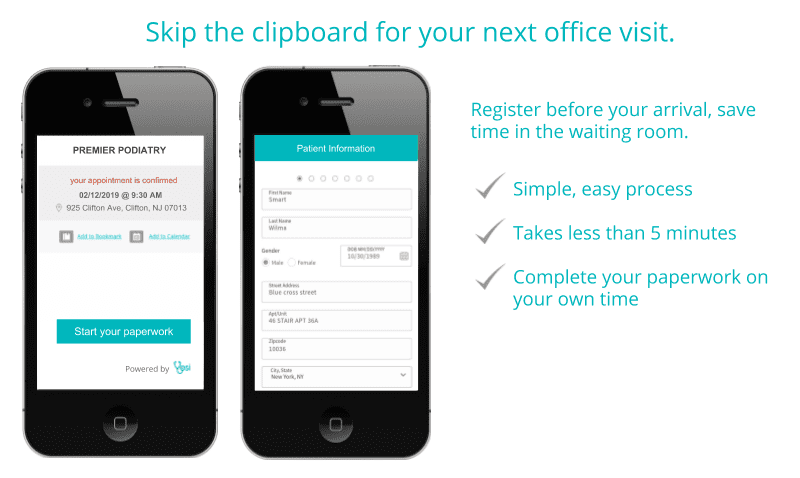 - Once you schedule your appointment, you are going to receive a text message inviting you to complete your paperwork electronically. You can fill all patient forms directly on your cell phone. Alternatively, you can check in using our tablets once you arrive in the office. All data is securely transferred into our system, significantly improving wait times, reducing errors and providing a more streamlined process for patients. As a bonus, paper use is lowered, resulting in less impact on the environment.